Director Taika Waititi’s Thor: Ragnarok is now playing around the world. In the run-up to the Marvel film’s release, I got to sit down with Karl Urban for an exclusive video interview about his work on the latest Marvel epic. He talked about how Thor: Ragnarok is a Taika Waititi movie set in the Marvel universe, how excited he was to work with Cate Blanchett, how his armor and look in the film were designed by WETA (the same people that did Lord of the Rings), the challenges of filming the ending action set piece during additional photography, and a lot more. In addition, he talked about making Bent with Sofía Vergara. As I’m sure you all know by now, the Thor sequel finds Thor (Chris Hemsworth) stripped of his hammer by Hela (Cate Blanchett), who escapes from her Asgardian prison and lays waste to the realm. Lost on a foreign planet, Thor teams up with Hulk (Mark Ruffalo) and some new and old friends to take on Hela and protect the universe from annihilation. 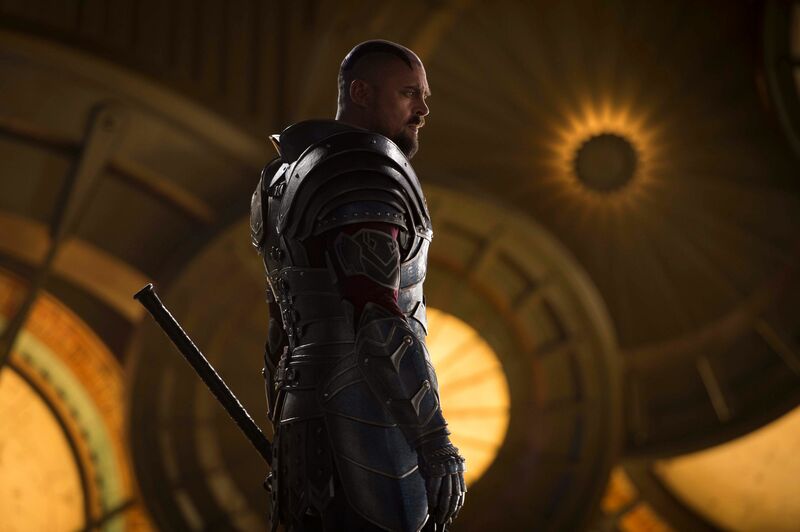 The film also stars Tessa Thompson, Tom Hiddleston, Idris Elba, Jeff Goldblum, Rachel House, Tadanobu Asano, Anthony Hopkins, Benedict Cumberbatch, Clancy Brown, and Ray Stevenson. I absolutely loved this movie. It’s probably the funniest Marvel movie to date and it’s also a really fun ride that’s also loaded with some incredible action sequences. I had a smile on my face from beginning to end. I can’t recommend Waititi’s film enough. Check out what Karl Urban on had to say in the player above and below is exactly what we talked about and the official synopsis. How he saw the film for the first time at the world premiere. How Ragnarok has its own sensibility. How this is a Taika Waititi movie in the Marvel universe. How the actors from Lord of the Rings were paired together. Getting to work with Cate Blanchett. Talks about his look in the film. How his armor was designed by WETA. What was it like going outside/off set with his haircut? Memorable moments from working with Cate Blanchett. Does he have fun filming the action scenes? How the ending action set piece was done during additional photography. Talks about his upcoming movie Bent with Sofía Vergara.